“We had very different skills. Mine are in planning and marketing, we had Vivian’s in building, and Elisa’s design skills,” says Jack Wu (right), who joined the Girards, Elisa (left) and Vivian in launching home.stead bakery & cafe. 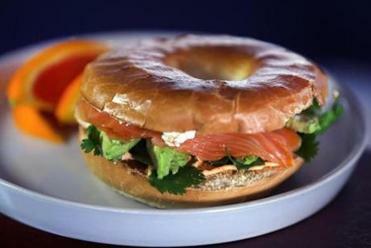 Smoked salmon, cream cheese, cucumber, avocado, arugula, and sriracha mayo on a bagel. Elisa Girard would have fit right in on the American frontier — the kind of person who would call building a log cabin, sewing a quilt, baking bread, and skinning a buffalo a good morning’s work. 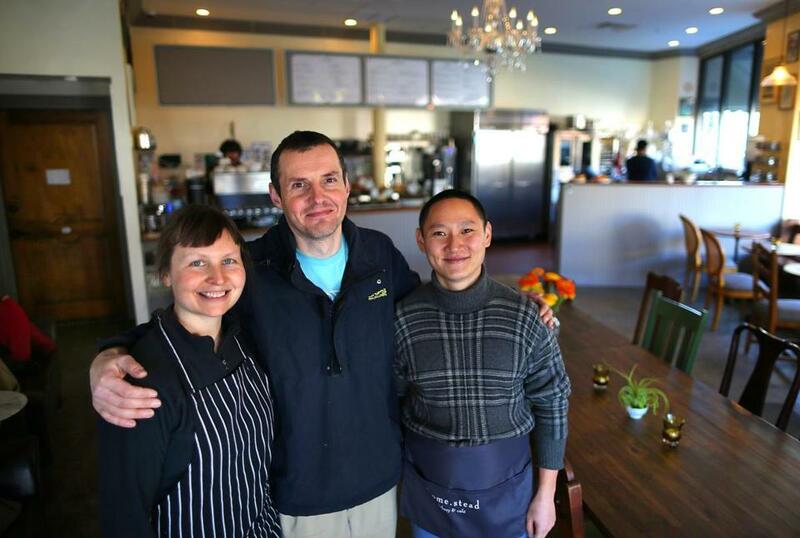 It seems right that Girard and her equally industrious husband, Vivian, named their new Dorchester cafe Homestead (or, as they spell it, home.stead). Instead of the frontier, they’ve staked their turf in Dorchester’s Fields Corner. In a handsome old building that once housed a dress shop, the Girards and a third partner, Jack Wu, have carved out a coffee shop that they hope will also act as a hub for the neighborhood, with plans for hosting community events and arts programming. 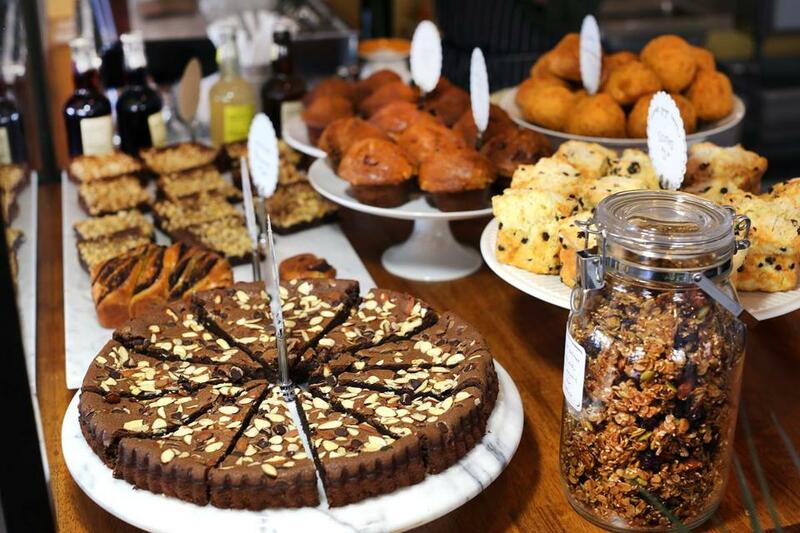 Home.stead offers a simple yet somewhat ambitious menu of homemade baked goods, fancy sandwiches, and direct-trade coffee, and has a full liquor license. But it wasn’t quite perfect. “Fields Corner was in desperate need of something like this,” she says. The busy corner of Dorchester Avenue and Adams Street where home.stead is located offers a typical urban hodgepodge of banks and beauty shops. “There was no place just to meet a friend,” says Girard. The idea had been percolating with the Girards for a while when they struck up a friendship with Wu, another Dorchester resident, while volunteering for neighborhood organization VietAID. Wu had a business background — most recently he served as CFO for College Bound Dorchester, Inc. — and he was looking for a new opportunity. On a visit to the Girards, Wu tasted some of Elisa’s cooking (freshly baked bread and cassoulet) and was convinced that a cafe with her in the kitchen could succeed. Baked goods at home.stead bakery & cafe in Fields Corner. In the manner of modern entrepreneurs, they launched an Indiegogo crowdsourcing campaign and held meetings to gauge community support and gather input. There was no shortage of local enthusiasm: The first kickoff meeting drew 40 people, the second 70. Like a frontier barn raising, the home.stead buildout drew on the efforts and generosity of friends and neighbors who contributed not only money but advice, expertise, and opinions. One supporter, a tea fanatic, helped develop the selection of Mark Wendell teas; someone from Counter Culture, which supplies the cafe’s coffee, made suggestions that “helped the flow” behind the counter, says manager Alex Mansfield. It took a proverbial village, and Elisa Girard is grateful for the run of luck that brought the village to the cafe’s doorstep: “People just showed up in the right place at the right time,” she says. The three partners take pride in their own serendipitous mixture of talents. “We had very different skills,” says Wu. “Mine are in planning and marketing, we had Vivian’s in building, and Elisa’s design skills.” Elisa studied art in college, and the cafe’s cozy-industrial aesthetic — exposed brick walls, mismatched chairs, high ceilings hung with chandeliers, colorful art, salvaged woodwork — owes much to her discerning eye. 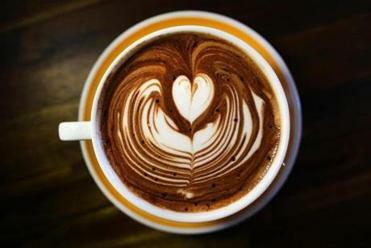 Latte art, after a pour, by home.stead bakery & cafe manager Alex Mansfield. And though she has no formal culinary training or restaurant background, Elisa oversees the kitchen. As a nanny and household manager for many years, she honed her cooking skills, and the breakfast foods, sandwiches, salads, and soups are both homey and sophisticated. But the partners’ grandest ambitions for the new venture go way beyond the menu. “We’re going to have a stage,” explains Elisa, “and we’ll have comedians, poets, storytellers, musicians, magicians. Once we get going, we hope to have entertainment every Friday and Saturday night.” The home.stead “vision” statement includes its commitment to supporting the community, celebrating cultural diversity, hiring locally and providing equitable wages, and making space available for various neighborhood activities. home.stead bakery & cafe, 1448 Dorchester Ave., Dorchester, 617-533-7585, www.dorchesterhomestead.com.